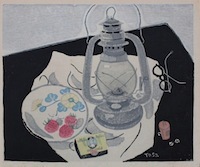 " Mud and Snow "
" Flowers on the Table "
" Still Life on the Table "
1904 Born in Kyoto . 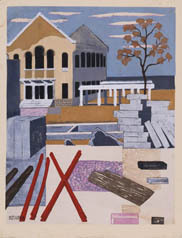 City Art College majoring in painting. 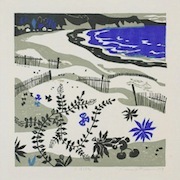 1928 His woodblock print was selected for the 9th Tei-Ten Exhibition. 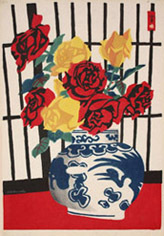 1941 His Still Life was exhibited at the 4th New Bun-Ten Exhibition. 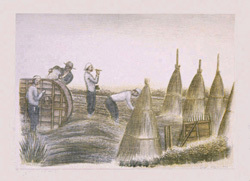 The subject was one on which he worked for long afterwards.
" 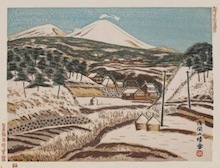 Snow-covered Mt. 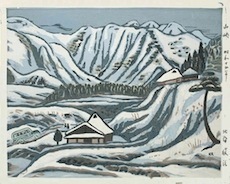 Asama in Fine Weather "
Born in Komoro City, Nagano Pref. 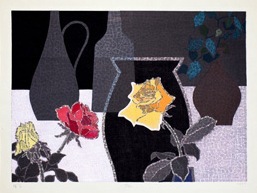 He learned lithograph from Hosoi Taneo. 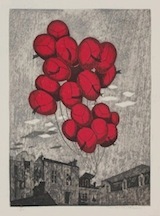 Print Association. 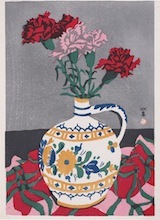 He was a founding member of Japan Print Association. 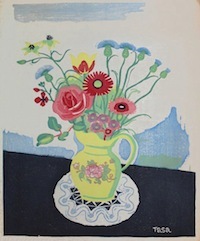 After World War II, he chose to live a farming life and stopped producing prints. 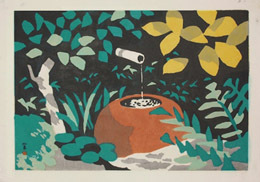 "Water Supply from a Spring"
Takehisa Yumeji, Kawanishi learnd by himself the art of woodblock printing. He worked in the post office near his home and in 1922 became postmaster. port city of Kobe. He won the fame of 'magician of colors'. 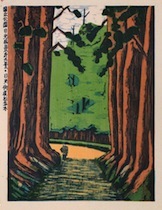 "The Nikko Road Lined with Cedars"
1893 .Born in Shizuoka City. 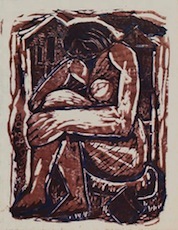 printing, which led him to learn under Yamamoto Kanae. 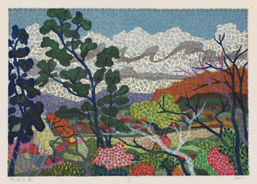 1919 He became member of The Association of Japanese Creative Prints.